Champaign County contracted CCRPC to update the Land Evaluation and Site Assessment system, a tool designed to provide county officials with a systematic and objective means to numerically rate a site or a parcel in terms of its agricultural importance. On Nov. 27, 2012, the Champaign County Board unanimously voted to approve Ordinance No. 913 – Adopting a Revised LESA System and approve Ordinance No. 914 – Amending Zoning Ordinance (to include the updated definition of Best Prime Farmland). Subsequently, on October 24, 2013, the County Board additionally approved Ordinance No. 933 with regard to Appendix A of the LESA system. LESA stands for Land Evaluation and Site Assessment. It is an analytical tool in the form of a numeric rating system which is used as an object means to rate and rank a site for agricultural importance. A LESA system is designed to take into account both soil quality and other social and economic factors affecting a site’s importance for agriculture. Federal, state, and local government officials use LESA as a tool to assist in formulating policy or in making land-use decisions that involve conversion of farmland. The system can help officials facilitate identification and protection of important agricultural land, and it can help assist them in implementing farmland-protection policies. A LESA system consists of two parts: Land Evaluation and Site Assessment. The Land Evaluation section is used to evaluate a tract of farmland based on the productivity of its soils. The soils information is based on data from the National Cooperative Soil Survey, one of the largest natural resource databases in the world. The Site Assessment section considers non-soil factors relative to a specific parcel of land. The assessment involves non-soil factors related to agricultural use, factors related to development pressures, and other public values of a site. In 1983, two committees (a seven-member Land Evaluation Committee and a 12-member Site Assessment Committee) were formed to prepare a local version of LESA for County Board review. 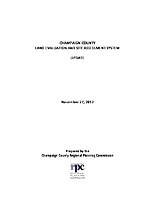 Champaign County adopted its LESA system in 1984, as documented in Champaign County Resolution No. 2248. LESA is used by the County’s Zoning Board of Appeals and/or County Board as a tool to assist in making a land-use decision that involves farmland conversion in Champaign County whenever land in the rural zoning districts (AG-1 AG-2 and CR Districts) is proposed for either rezoning or a special-use permit. To obtain a LESA score for a particular site, the Land Evaluation score and the Site Assessment score are separately calculated. Each score is then combined to result in a single number. The higher the total LESA score, the more highly rated a site is for agricultural use.